I once again had the pleasure to stop in and see first hand the fun, camaraderie and artistic development that is taking place with a vibrant group in Emery Village. 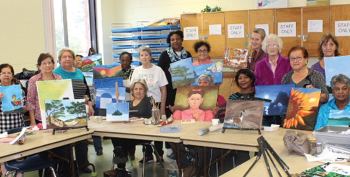 Each Wednesday, local seniors gather at the Carmine Stefano Community Centre to develop their art skills under the excellent instruction of local Emery artist, Lucy Catania. The number of participants has grown steadily every week since its inception, which is very satisfying to see. Everyone is welcome to attend free of charge.